Neat graph-paper variants are easy to come by, but I decided to pull together some collections that lend themselves to certain geometrically-inspired math doodling. The first collection includes isometric dot paper, tumbling block paper, and some detached square paper - all generated at incompetech.com (what a name!). Isometric dot paper is now a staple of middle-school math (I only first saw it a few years ago though). 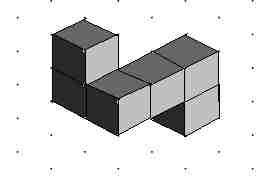 Tumbling block paper is a quasi-regular rhombic tiling that's really just the isometric paper with the dots connected in a certain way. 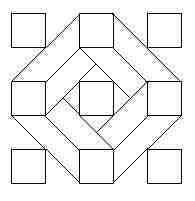 One of the things that the "detached square" paper helps you draw are overlapping columns that look like the Penrose impossible staircase. The graph paper and other stuff from this blog can be found here.